Just found this on Hemmings. 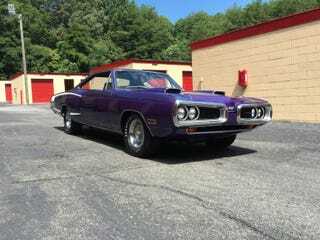 My grandfather had a purple 1970 Dodge Super Bee back in the day and lived in North Carolina.He didn’t own it for long, and this one is low mileage. I’ll talk to my grandmother and see if it matches her memory, then I may try and contact the dealer. UPDATE: Talked to my mom; his was an automatic, so it’s not this one. It’s still pretty though. Hello and Thank You for visiting our latest Classic Car Consignment up for sale by The Motor Masters! Up for sale is an INCREDIBLE 1970 Dodge Superbee!! NUMBERS MATCHING and Insured by Lloyds Of London!! Restored twice, last in 2011 and been in storage since. 1000 miles on new motor.. 50,000 total miles. 440-6 Pack with Pistol Grip 4-spd...one of 599 built in 1970 with Motor/Trans Option, and less than 10 known to exist as ORIGINAL!! Plum Crazy Purple, the number one most desired color for Chrysler Muscle Cars. In the the National Calendar MUSCLE CAR CALENDAR for 2005. Dana 60 rearend with 4:10 Gear Ratio. Correct Rally Wheels with Period Correct Goodyear Polyglas G70-15 White Letter Tires. Extremely heavy option list to include: C-stripe Superbee Decal only available on the 1970, Shoulder Belts, Chrome Fender Well Inserts, Chrome Pedal Dress Up Kit, Tic-Toc-Tac, Center Console, AM Radio, Front Disc Brakes, Bucket Seats. Original Broadcast Sheet and Maintenance Manuals. LASTLY, numerous parts come with the car, which should make the Serious Collector very happy. Number one is a Date-Correct Replacement Engine Block dated JAN 1970. Original Block in the car dated NOV 1969. All the significant parts removed and replaced in the Restoration have been saved. Brand New correct 1969-1970 1/2 Aluminum Edelbrock Intake Manifold, New Chrysler Aluminum Intake, Aluminum Headers from TTI, 2 sets of replacement Cylinder Heads, one set of correct 906's has Enlarged Valves 2:14intake/1:88 Exhaust, the other set is 956 Heads with Hardened Valve Seats for Unleaded Gas. Simple, if you are looking for a Performance, ALL ORIGINAL 1970 Superbee, this is the one you want!! Folks, this car hasNEVER BEEN ADVERTISED!! Don’t let this one get away becuase it won’t last long!! Buy it TODAY and add it to your Collection! !